The tablet's camera uses Ground Plane Detection to detect the floor of the respective room and then positions the model accordingly. 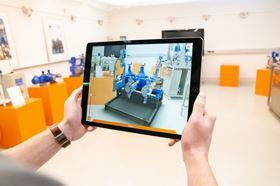 LEWA has developed its Augmented Reality (AR) app by adding a key feature to display the inner workings of pumps, which will be on display at Hannover Messe. Hannover Messe takes place from 1-5 April and Lewa will debut its AR solution that allows the user visualise a pump model from the Ecoflow series. Using a tablet, it is possible to position the pump freely within the virtual space. The tablet's camera uses Ground Plane Detection to detect the floor of the respective room and then it positions the model on this floor on the screen. This way, the freely scalable 3D model lets you take an in-depth look into the complex pump structure. For example, the user can carry the tablet around the room to examine the exhibit from all angles as well as inside and out. In addition, various animations can be started that map extreme scenarios such as a diaphragm rupture or a blocked suction line. On this basis, the program then displays the reaction and operating principle of the Ecoflow pump in the specific situation. The Lewa team will be displaying the new AR app at Pump Plaza, Hall 15, Booth G43 (05) during Hannover Messe.